Tampa Bay Lightning center Steven Stamkos admitted Wednesday was a roller-coaster day. It started with Stamkos being declared healthy enough to return to the lineup after missing 45 games with a broken tibia sustained Nov. 11 against the Boston Bruins. It continued with the announcement hours later that Martin St. Louis, Tampa Bay's captain and leading scorer as well as Stamkos' linemate, had been traded to the New York Rangers. The morning after, Stamkos was looking forward to his anticipated return to the Lightning lineup against the Buffalo Sabres on Thursday. "I feel great. It was nice to have a morning skate where I was part of a line. It's exciting," Stamkos said. "I'm sure I'll be more anxious, maybe a little more nervous heading into the game. But I think once you get the first couple of shifts out of the way you're going to be fine." During Stamkos' nearly four months out of the lineup, every expectation was that he would again team up with St. Louis when he returned. 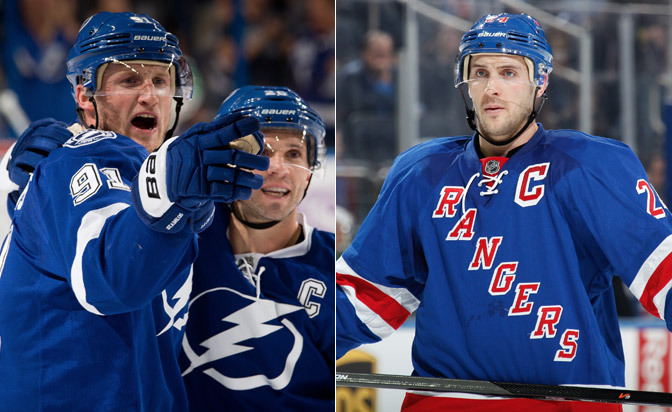 The two formed one of the game's most dangerous offensive duos since Stamkos entered the NHL in 2008-09. St. Louis won the Art Ross Trophy last season as the League's top scorer with 60 points in 48 games, with Stamkos finishing second three points behind him. With his friend and mentor no longer with the Lightning, Stamkos is ready to begin a new chapter in his career. "It's going to be a little tougher. He's one of the best players in the game. Anytime you take that out of the equation you're going to have to work a little harder," Stamkos said. "We know what we have to do. Marty was a big part of this room for a long time. He's taught us a lot and we have to use those things he taught us to teach the other guys. Everyone steps up in a bigger role now." Stamkos will center Tampa Bay's top line between Teddy Purcell and Alex Killorn, two more players who looked to St. Louis for leadership early in their careers. Regardless of Stamkos' personal feelings, the Lightning star said his team had no choice but to move on without their captain, who was traded for Ryan Callahan, a first-round pick in the 2015 NHL Draft and a conditional second-round pick in 2014. "To be honest, when we get to the rink tonight, as hard as it is, I think guys are going to find a way," Stamkos said. "You have to deal with those things as a professional athlete. There's going to be things you can't control, so you focus on the things you can control and go from there." That sentiment was echoed throughout the Lightning locker room as they welcomed back one of the League's most prolific scorers. "It's not only [Stamkos] coming back, it's not only the trade," coach Jon Cooper said. "The trade deadline is passed. Our focus now is the last 20 games. We have to win to make the playoffs."